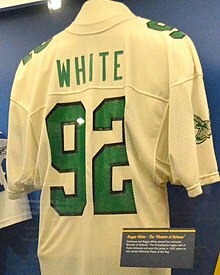 Reginald Howard "Reggie" White (December 19, 1961 – December 26, 2004) was an American football player who is now in the Pro Football Hall of Fame. He is well known for being a Evangelical Christian minister. This led to his nickname, "the Minister of Defense." This page was last changed on 13 January 2019, at 16:54.